He Asked with a Banner, She Said Yes! Banners.com printed a proposal banner for a couple. He proposed at a festival, and she said yes! They sent over a copy of the newspaper where their story was featured. Thank you for sharing your story with us! We love seeing our banners make a difference in people's lives. 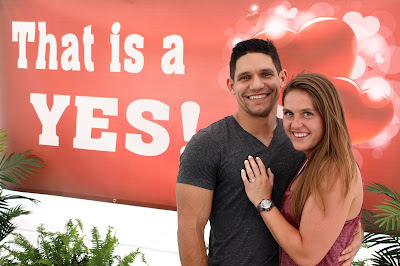 If you are looking for a unique way to propose, visit our engagement banners page! for templates and banner ideas. You can customize a template in our online designer, upload your own artwork file, or have one of our graphic designers create your artwork for you.